cause just beneath the bark. The Emerald Ash Borer was recently identified in West Point, NY, making the threat to our Ashes in the NY metro area even more immanent. The insect was first found in Detroit in 2002 and has killed tens of millions of Ashes as it has moved east. 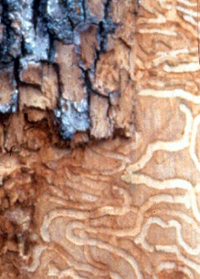 Although they're easiest to identify as adults, Emerald Ash Borers cause the most damage as larvae. They live beneath the bark, eating away at the living cambium layer of the trunk and leaving "galleries" of removed tissue behind (see photo). It only takes 3 years for a healthy tree to die completely from an Emerald Ash Borer infestation. Signs of decline include splits in the bark, capital "D"-shaped exit holes from where the borers exit the trunk, higher than usual woodpecker activity, dropping leaves throughout the growing season, and sparseness in the canopy. The key to successfully saving a tree from Emerald Ash Borer is through preventative treatment. The best treatment currently available is an insecticide injection made directly into the trunk that provides protection from EAB for 2 years. If you have feature Ash trees on your property, this is definitely a course of action to consider. Images: Galleries - Daniel Herms, Ohio State University, Bugwood.org. Borer - Howard Russell, Michigan State University, Bugwood.org.